I got up at 5:30 to feed Goober, then quickly get ready and be out the door by 6:15 at the latest. Unfortunately my "at the latest" turned into 6:30 as Goober took forever to eat, I couldn't find my Road ID, and the peanut butter was not cooperating with my bread and jam. Excuses, I know. But I had a reason to get out and start running by 6:50am on the trail...I was to meet my friend Leah at 8:30 for 10 miles, but I was running 10 miles solo prior to our meetup. Oh boy! 10 solo miles! Since my toes and feet are not in the best condition (missing 3 toenails, 6 black nails, and of course the ever-present foot neuroma pain), I wanted to try out running without my custom orthotics. To be honest, I think they've been hurting me more than helping lately. Basically, I'm figuring out what shoes I want to wear for this month's (!) marathon. Eh, more on that later. The route I decided to take was out 5 miles on the Orting Trail, then back to the car to meet Leah, then out 5 miles in the other direction, then back to our cars again. It sounds so much nicer when it's broken into four 5 mile chunks* (thank you, Kerrie, for the idea!). So, I'll break down the run in chunks, and bullet points. Hmmm, quite a few cyclists out this morning. Why are my calves feeling sore? My water tastes like sink. Oh good grief, I don't want to be murdered behind this creepy looking house! I wonder how Kerrie is doing on her 20 miles in Chelan? I CAN DO THIS. EMZ ran for 24 hours on a freaking TREADMILL....this is NOTHING. Wow calves, you can stop pestering me. This isn't cool, ya know. Don't choke on that Shot Blok. Don't choke on that Shot Blok. Railroad crossing again. Fartlek! AAAA! Man, that fence needs some serious TLC. Giant paint chips all over the place. I wonder if I can get a foot transplant? A slower pace....ahhhhh...this feels alright. I can do this! I wonder if Sam the Eagle is around? Uh oh. My stomach is not liking me right now. No bathrooms on this trail either. Oh god oh god oh god. This weather is perfect for a run! Upper 40s and overcast! Yeah! Shut UP stomach! You do NOT need to use the bathroom! Ohmygosh, I'm really DOING this! Don't inhale the alder seeds. You choked the last time that happened. I love the sound of Gus' reminding me about the miles ticking by! Ok, the slower pace kinda hurts. Kinda. That Shot Blok was STALE. It's like eating an actual rock. Don't choke. Again. Yup, I drooled on myself. Yeah Leah! Mileage PR! 16 miles! WE FINISHED! We really freaking finished! I ran 20 miles?!?!?! Holy crap! After this run I just want to be done with marathon training and focus on half marathons. All I want is to say I'm a MARATHONER. This is too difficult with a nursing 6 month old. I'm drained (ha!). Plus, who knows when I'll get to run a marathon again with my injured feet. Perhaps I'll end up getting the surgery and it'll be better? That's in the future. I'm just done with worrying about running these long distances. They aren't easy. Plus, I missed my long run buddy, Kerrie. But thank you Leah for running with me!!! I appreciate it. All I know is that it felt amazing to see 20.00 on Gus' lovely face. Weird fact: As soon as I got in the car after the run, Kerrie texted me to ask if I ran 20. Wow. Great timing! Plus, she finished her 20 miles in 3:26 too!!! Weird! Her recap is HERE. I forced myself to take an ice bath, and it definitely helped with my foot pain (YES!). However, my calves are still sore, 4 days after this run. I've never had this problem before. I've iced them, stretched them out constantly, wore compression socks, heck, even rolled them with my version of "the stick." Even the ibuprofen doesn't seem to be working. It's weird I say. OK, BRING IT ON MARATHON! You are MINE! *"Chunks" is a funny word. Ha ha! Chunks. I read somewhere that taking Ibuprofen during the acute stages of muscle pain can actually slow the healing...I forget where I read that (sorry). I have noticed that I tend to recover more quickly when I take Tylenol. It could be a coincidence or placebo or both :) Thanks for the 'chunking' tip! Awesomesauce! So excited for you (and Kerrie)! I know that marathon day is going to rock for both of you. I feel you on the nursing and marathon training thing. Natalie was 9 months old when I ran marathon #2. I constantly felt thirsty and drained. Let me say, marathon training is much improved when you only have to nourish yourself. Four 5-mile segments seem simple! That's the kind of mental tricks that keep you ahead of the game. Love all the random thoughts! Congratulations on conquering 20! You'll never forget that feeling of your first 20 miler. It's one of those things you'll look back on with such beaming memories, it's just like your first 10 miler and when you do actually cross that finish line to become a marathoner. You did it! Congrats on 20 miles! I have been complaining about my half marathon training and saying that I need to drop my races down to 5Ks and 10Ks again b/c it just takes up so much time. But hopefully it will be worth it after I finish the race this Sunday! Awesome! 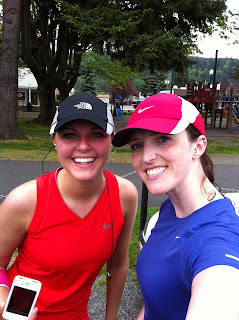 You and Kerrie are seriously kindred - same time on the 20, and same thoughts on being done with marathons [for now???] after this one. I didn't even run 1 mile when I was nursing. You really are amazing. What an accomplishment. Wow! You are READY! I loved reading this recap. So funny! I am heading out to the same trail today for 13 (I hope), but I'm always too scared to run my favorite stretch (by Christmas tree farm) by myself on a weekday. I wish I lived further south if only to run the Orting trail...it looks beautiful. You are so ready for this race, be confident and trust in your training. I wish I was running the full, but the good thing about doing the half is I can be done in time to cheer everyone on in the full! Trying to figure out spectator spots since the 2nd half is mostly along the viaduct (no earthquakes plz). I missed you, too! But I think we were running with each other in spirit -- especially with our times! Crazy! Take care of those calves. Are taking some rest days? Calf pain makes me nervous. Your are super mom! 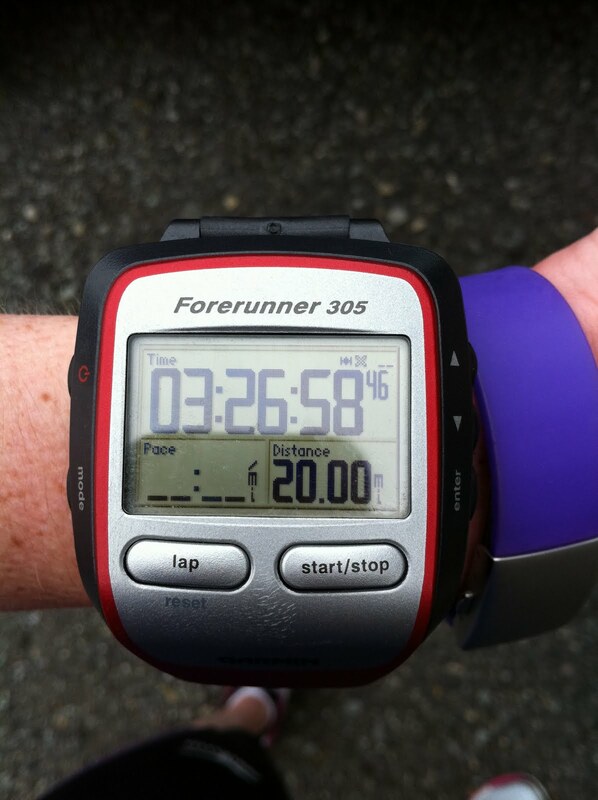 Running 20 miles while nursing a 6 month old - you ROCK! Are you going to do any longer runs before your marathon? Finally - have you had any cortizone shots for your neuroma? I know that I had two and it finally went away over 2 years ago and it has not re-surfaced either. Way to get it done! I broke my 20 miler into 5 mile chunks too, thinking if it was getting hard all I had to think about was the current 5 that I was running. Enjoy your taper! My calves get really tight after long runs...I have to roll them out a lot with the stick & stretch. Grrrr! CONGRATS, CONGRATS! There is nothing easy about running for 20 miles! Pretty sweet feeling when your done though! Amazing how a 20 miler can make you wonder why you signed up for a MARATHON in the first place but when you get done with a long run it totally builds up the confidence. It going to be amazing when you finish your marathon...best feeling EVA and you will be in the MARATHON CLUB...you are almost there. I loved the feeling of finishing my marathon and knowing that I did it and I never have to do it again...if I don't want to...because I DID IT! Great recap...I love that you said "my water tastes like sink" that's funny! Way to gut that run out! Nice work! I've got to keep track of these routes you are doing for my marathon training (starts as soon as I finish the rock and roll half!). I'm encouraged that I can do it after reading your blog. Thanks! 1. i am in exactly so in the same boat!!! 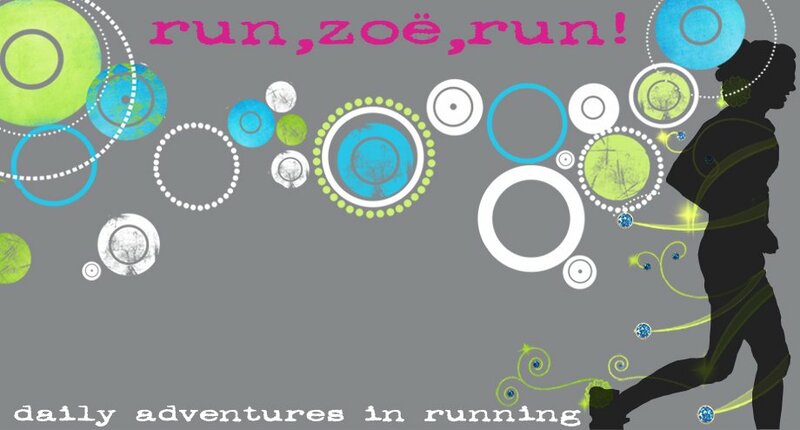 i can't wait to go back to half marathon training!!!!! 3. congrats on the 20 miler! Great job! 20 miles is no joke! 20 miles can seem SO long - I don't know if I ever want to run that far again.